Chef Kevin Templeton at one of his restaurants. While any chef could argue for or against the farm-to-table trend sweeping the nation, I truly love the idea behind sourcing food from local producers. The amount of pride I have when I create a dish using ingredients from local, or nearby farms is second to none. Living in San Diego, we have access to produce that most of the county doesn’t. This fact alone helps lower the price for chefs and restaurants in the area. With over a third of the country’s vegetables and nearly two-thirds of the fruits and nuts grown in California, it’s easy to support sourcing locally. Farm-to-table creates a great sense of community. Knowing who grew your food is such a cool feeling. I’ll be the first to admit, it isn’t always easy to find the time to visit local farms, but there are great alternatives. For both barleymash and The Smoking Gun, our produce company has an awesome farmers market program in which they visit local farms to pick out the best available produce. This is perfect for busy folks because they can simply pick up a bag of local amazing product every week. Another great upside to sourcing locally is an increase in creativity for your menu. When you’re working with seasonal ingredients, you can incorporate those as substitutes for the norm. Cauliflower is a veggie that is versatile and tasty. Substitute your pizza dough or high-carb white rice with chopped cauliflower. During the cooler months you can opt for a special beetroot salad with goat cheese or a cabbage winter soup. Our bartenders love playing around with cucumbers in summertime cocktails. Sourcing locally allows you to have a little more fun with the freshest ingredients on the market. Farm-to-table is so much more than a trending food fad; it’s become a social movement changing the entirety of the restaurant industry. And with a little strategy, planning and relationship building, it’s a movement whose value far exceeds any cost disadvantage. I love my weekly drives up to Olivewood Gardens where we drop off about 700 to 800 pounds of unused produce scrap for composting. At Olivewood, they teach children and adults the importance of recycling and reusing our resources. If you’re spending the extra dough on locally sourced produce, it doesn’t hurt to see the would be “trash” turned into compost, which grows more food. It’s the ultimate closed loop system. If you have the chance to visit your local farms, please do. Take your children, friends, coworkers and/or family with you to experience the impact these local growers have on our economy, environment and community. 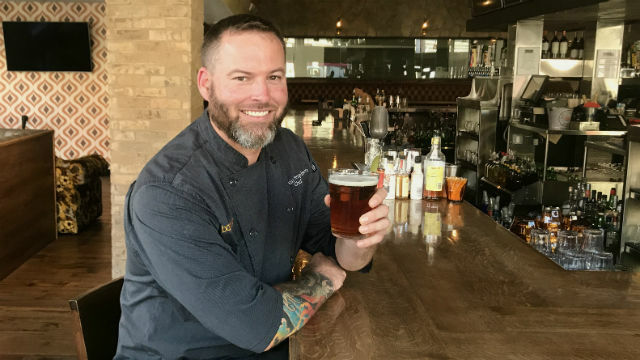 Kevin Templeton is executive chef of barleymash and The Smoking Gun, both located in the Gaslamp District.